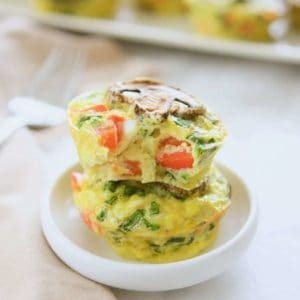 Breakfast Egg Muffins – such an easy breakfast option. Growing up, I used to love ordering a “Spanish” omelet at our favourite breakfast place. 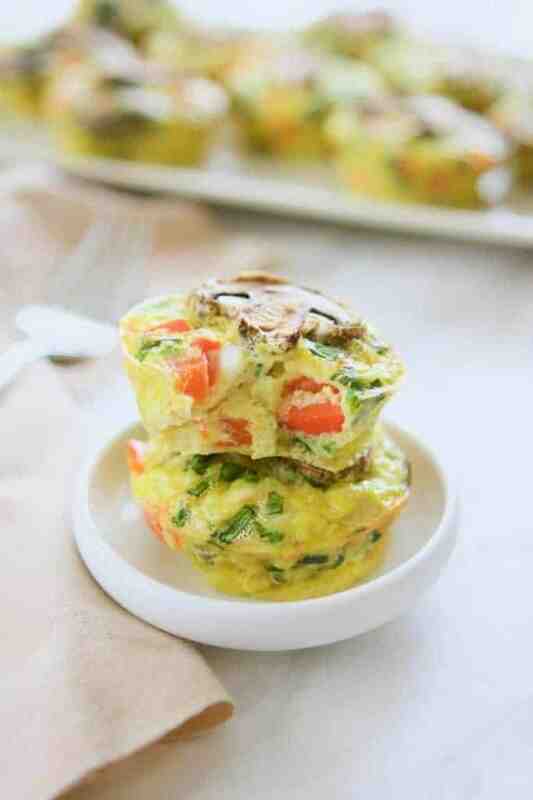 It was an omelet made with mushrooms and pepper, and I wanted to re-create this old favourite in a muffin pan. Eggs. Get pastured eggs if you can. You can really tell the difference. The yolks are a deep yellow colour vs. “organic” eggs or even conventional eggs. We get our pastured eggs from a local farm shop. No need to be afraid of eating the yolk too! 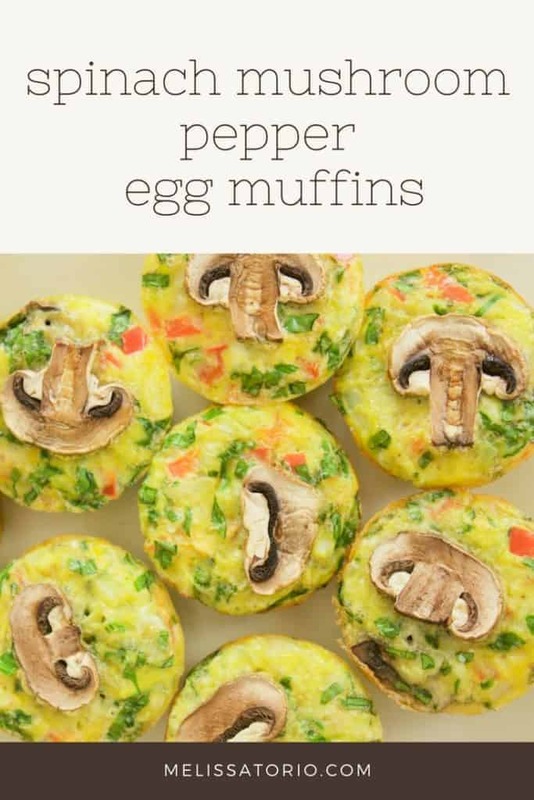 Bell peppers are high in vitamin C. I love how it adds colour and crunch to these egg muffins. Spinach. 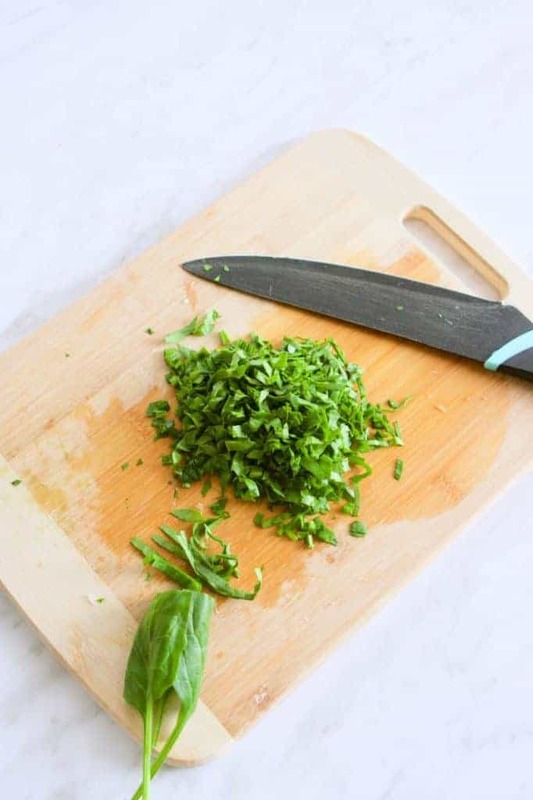 Cut chiffonade – pile up spinach leaves, roll them together and slice thinly. Slice again crosswise to get small pieces of spinach. Pre-heat oven to 350ºF. Lightly grease a muffin pan with coconut oil. 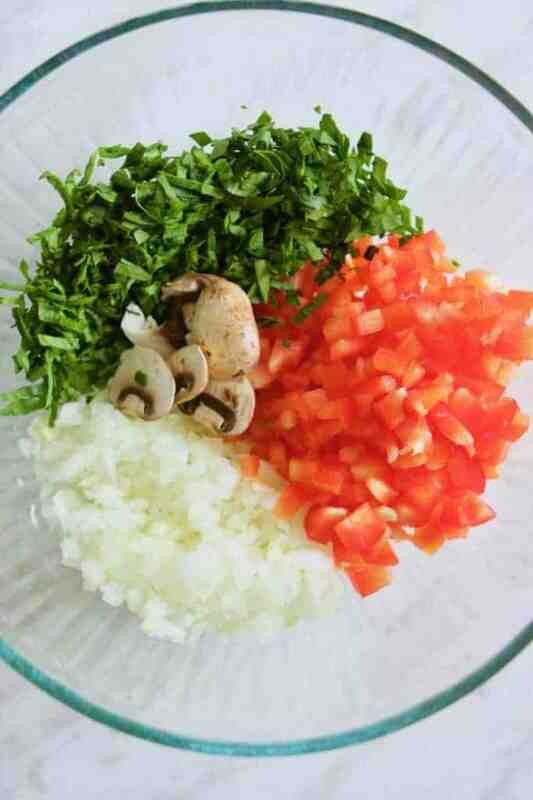 In a large mixing bowl, add the onion, pepper, spinach and mushrooms. Mix thoroughly. 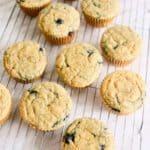 Distribute the mixture evenly into the muffin pan. In the same bowl, add the eggs and salt. Beat well, then distribute evenly into the muffin pan. Place pan into pre-heated oven and bake for 20-25 minutes or until eggs are set. Tip: You can freeze these for a make-ahead breakfast option. Let me know if you try this recipe, please leave a comment and rating below! 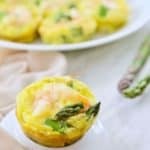 Make these easy breakfast egg muffins ahead of time and freeze them for a ready to go breakfast option. Pre-heat oven to 350ºF/180ºC. 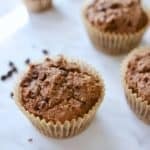 Grease a muffin pan with coconut oil. 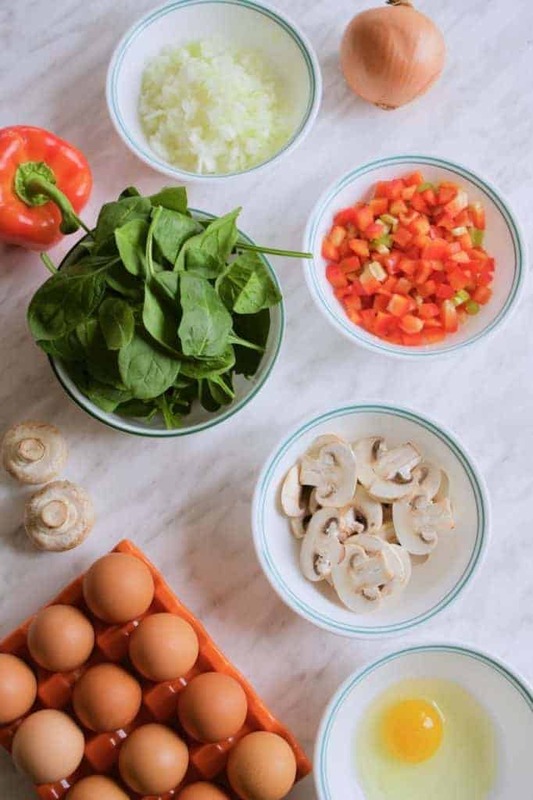 In a large bowl, add onion, pepper, mushrooms and spinach. Mix well. Scoop mixture into muffin pan, distributing evenly. In the same bowl, add eggs. Beat eggs thoroughly. Add salt and mix well. 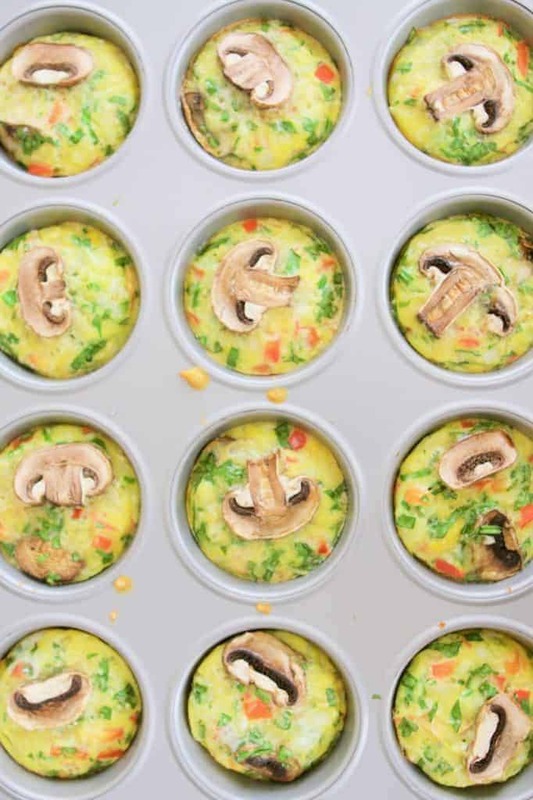 Distribute egg mixture evenly into the muffin pan. Place pan in oven and bake for 20-25 minutes or until eggs are set. Make these ahead of time and freeze for a quick breakfast option.